Alysia Montano, Ghoncheh Ghavami, and Whitney Zelee. From the traditional top 10 to the notable 100 to the critics’ picks, year-end lists cover a lot of ground. They subjectively highlight the good, the bad, the eye-opening, the uplifting, and the history-making. Taken all together, it’s hard to imagine they leave out anything significant. But what about the blink-and-you-miss-it moments? What about the overlooked instead of the overhyped? In the world of women’s sports, there are plenty of moments that deserve more attention. For every 2014 headline-maker such as Mo’ne Davis, Becky Hammon, and Mikaela Shiffrin, there are many less-heralded women in sports, such as Alysia Montano, Whitney Zelee, and Ghoncheh Ghavami. So, in a nod to Title IX, here are nine women’s sports stories that merit another look, a little extra love from year-end list makers. On Oct. 8, shortly after the Trinidad and Tobago women’s national team arrived in Dallas for a World Cup qualifying tournament, the team’s coach, Randy Waldrum, tweeted a series of desperate messages. I need HELP! T&T sent a team here last night with $500 total. No equipment such as balls,no transportation from airport to hotel, nothing. The tweets went viral in the US soccer community and beyond. MLS club FC Dallas provided training facilities, restaurants offered free meals, fans sent money. In eight hours, the team raised $9,300, including a donation from the cash-strapped Haitian women’s squad. Running the 800 meters at the US track and field championships in June, Alysia Montano finished last in her qualifying heat in 2:32:13, nearly 35 seconds slower than her personal best. Still, the Olympian and five-time national champion drew an ovation. That’s because she competed while eight months pregnant. Montano felt good running throughout her pregnancy and figured why not race. Her two laps around the track presented a refreshingly different image of pregnancy and showed the challenges top female athletes face when balancing family and career. How many athletes claimed a medal cross-country skiing in Sochi, then captured major marathon titles in Boston, London, Chicago, and New York? Only one. Tatyana McFadden. The wheelchair athlete started 2014 at the Sochi Paralympics, taking home silver in the 1-kilometer sprint. Then she won the marathon grand slam in the women’s wheelchair division. For the second straight year. She’s the favorite for a three-peat in 2015 and for beating the competition in any other sport she tries. There was no duck boat parade down Boylston Street. But whatever you think of women’s full-contact football, a championship is a championship. The Boston Militia completed an undefeated season (11-0) with a win over the San Diego Surge for the 2014 Women’s Football Alliance title. Behind six touchdowns and 291 rushing yards from Whitney Zelee, the Militia trounced the Surge, 69-34. With championship rings for the 2011 and 2014 seasons, the Militia became the first team with two WFA titles. In June, British-Iranian Ghoncheh Ghavami took part in a women’s rights protest, attempting to watch a men’s volleyball match at a men-only arena in Tehran. After initially being released on bail, Ghavami soon found herself rearrested and jailed in Iran’s notorious Evin Prison. She was finally freed in November. Following what happened with Ghavami, FIVB, volleyball’s world governing body, said Iran cannot host international events as long as women are banned from the stands. Yes, Lindsey Vonn’s every skiing move and every dating move make headlines, particularly when her skiing involves shredding her right knee and her dating involves Tiger Woods. Since the 2013 world championships, she has suffered two ACL tears, an MCL tear, and a fractured right tibial plateau. It’s unbelievable doctors can still stitch together a knee stable enough for skiing. Even more impressive? In early December, while competing in downhill at the first World Cup weekend of her latest comeback, she won for the first time in almost two years. There should have been more amazement. If it was an NBA or NFL MVP returning from a blown-out knee and picking up where he left off, there would have been. 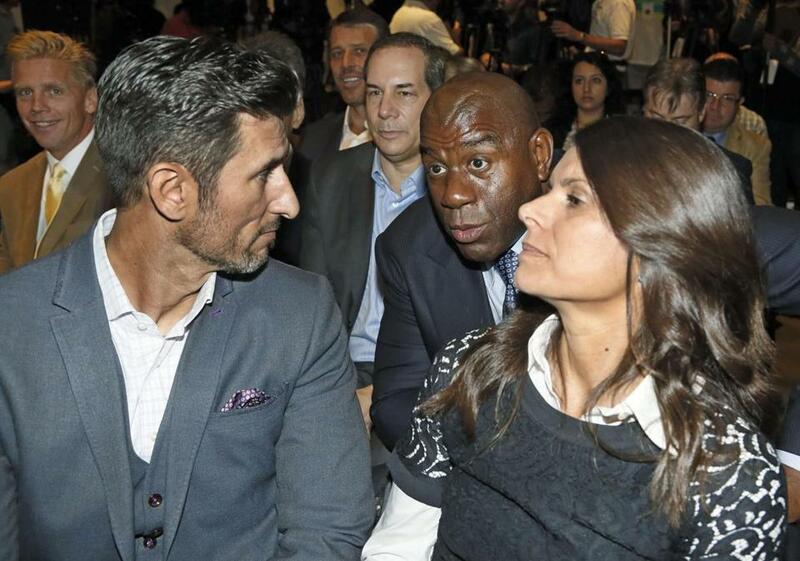 Mia Hamm (right), Magic Johnson (center), and Nomar Garciaparra (left) at a news conference on Oct. 30 in Los Angeles. Soccer superstar Mia Hamm — two-time World Cup winner, two-time Olympic gold medalist, two-time FIFA World Player of the Year — bought an MLS team. OK, she joined 21 others as owners of the new Los Angeles FC, including Magic Johnson, motivational speaker Tony Robbins, and Hamm’s husband, Nomar Garciaparra. Still, it’s an interesting move. She said it was a right time, right place kind of deal. Maybe she’ll take an active role with the team. Maybe she’ll help strengthen ties between men’s and women’s pro soccer down the road. There is conservatism. And then there is Afghan culture, where women place themselves in danger by riding bikes in public. Men throw stones and run them off the road. Still, interest in competitive women’s cycling is growing in Afghanistan. Female riders now dream of representing their country in the Olympics. By biking on local roads and competing internationally as they did in 2014, the women aim to open minds. Equally important, young girls are gaining the opportunity to bike thanks to nonprofit Mountain2Mountain. In April, the charity reported that it gave 12 girls in Kabul their first bikes, hoping to build momentum for a long ride. Carina Vogt of Germany won the gold medal in the ladies' normal hill ski jumping. Under floodlights in Russia, 30 women from 12 countries made history in February, competing in the inaugural women’s ski jumping competition at the Winter Olympics. They lifted off and landed on the normal hill, and drew plenty of attention. But it was the women’s lone Olympic event at the Sochi Games. The men’s program included three shots at Olympic glory — the normal hill, large hill, and team competitions. 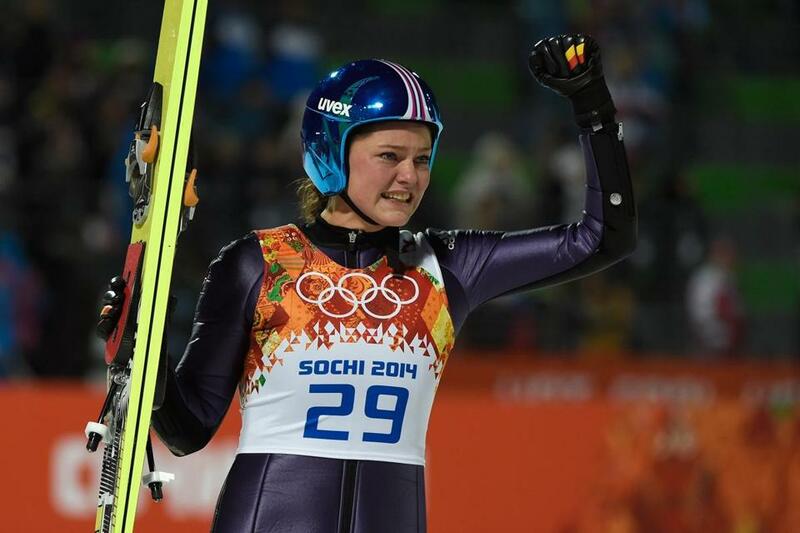 The disparity came up in conversation with US women ski jumpers. And it served as a reminder that inclusion doesn’t mean the bid for equality is over.